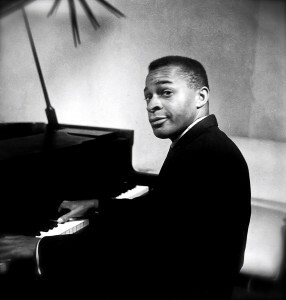 Phineas Newborn Jr. About Phineas - Phineas Newborn Jr.
Phineas came from a talented, musical family. Over his 30 year career, he enjoyed performing and recording with them in addition to many Jazz greats including Lionel Hampton and Charles Mingus. His father, Phineas Newborn, Sr., was a blues musician and his younger brother, Calvin, a jazz guitarist. Phineas studied piano as well as trumpet, and tenor and baritone saxophone. Newborn first played piano in an R&B band led by his father on drums, brother Calvin on guitar, Tuff Green on bass, Ben Branch and Willie Mitchell (a future Hi Records star). The group performed as the house band at the now famous Plantation Inn Club in West Memphis, Arkansas, from 1947 to 1951. The group was featured as B. B. King‘s band on his first recordings in 1949, as well as the Sun Records sessions in 1950. In 1951 the group went on tour with Jackie Brenston as the “Delta Cats” in support of the record “Rocket 88“, recorded by Sam Phillips and considered by many to be the first ever rock & roll record. (it was the first Billboard No. 1 record for Chess Records). Among his first recordings in the early 50’s, are those for Sun Records with blues harmonica player Big Walter Horton, We Three (as a trio with drummer Roy Haynes and bassist Paul Chambers), and his debut as a solo artist on RCA Victor, Phineas’ Rainbow. In 1956 he began to perform in New York City, making his first album as a leader in that year. His trio and quartet performances included noted players Oscar Pettiford, Kenny Clarke, George Joyner and Philly Joe Jones. As interest in his style spiked, Phineas performed internationally. He performed solo in Stockholm in 1958 and in Rome the following year. He returned to the US to live and work in Los Angeles in 1960, he recorded a sequence of piano trio albums for the Contemporary label. However critics had now fallen out of love with Phineas’ and described his latest style as “facile”. Newborn’s later career was intermittent due to ongoing health problems including admission to the Camarillo State Mental Hospital for some periods. He also suffered a hand injury which hindered his playing. Beginning in the late 1960’s and through mid-1970’s, he faded from view, underappreciated and under-recorded. He made a partial comeback in the late 1970s, earning a Grammy nomination in 1974 for his recording of Solo Piano, but feel back into obscurity through the early 1980s. This return failed to benefit his financial situation. He died in 1989 and was buried in Memphis National Cemetery. Phineas Newborn Jr. is survived by his son Phineas Newborn III and daughters Shelly & Pamela Newborn. A great way to listen to Phineas & see him in action. Enjoy! Meticulously translated Phineas' solos with the hope of inspiring & educating future generations of Jazz artists. Dr. Bruce Dudley is an Associate Professor of Commercial Music at Belmont University in Nashville and Artist Teacher of Jazz Piano at Vanderbilt University. He holds a Doctor of Musical Arts degree in Jazz Studies from the University of Colorado in Boulder, a Master of Music degree in Jazz and Contemporary Media from the Eastman School of Music, and a Bachelor of Science degree in Music, Business, and Technology from New York University. Dudley has performed in jazz festivals, clubs and concerts in Canada and the United States. His music has been heard on National Public Radio, Canadian Broadcasting Corporation, and satellite radio. His recordings as a leader include The Solo Sessions (2012), Mostly Monk (2010), and Semblance (1997). In addition, Dudley has performed and recorded with many other jazz artists across North America over the past 25 years. Phineas III tiresly brings together the resources to insure his father's Jazz legacy is preserved.